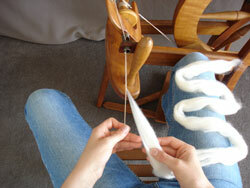 To spin a slub yarn you will use either a wheel or a spindle. 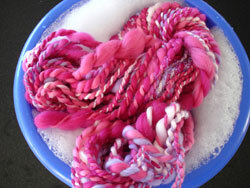 REQUIRED KNOWLEDGE : You need to know how to spin a even medium size yarn. 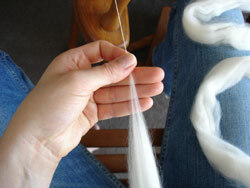 The easiest fibers to use to spin a slub yarn are pre-separated commercial tops (here). 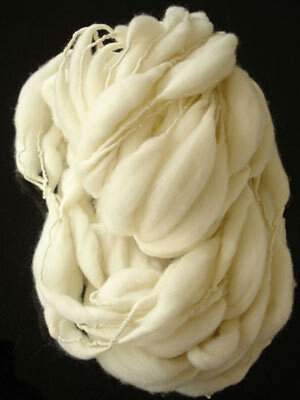 But you can also use well carded or combed wool. Start as usual (Beginners please click here to access the first spinning course). You MUST prepare your top before starting to spin. 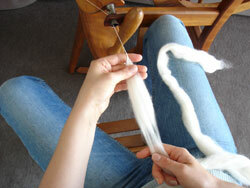 The top/sliver you will be spinning needs to be of the same size as the thickest part of the yarn you wish to create. 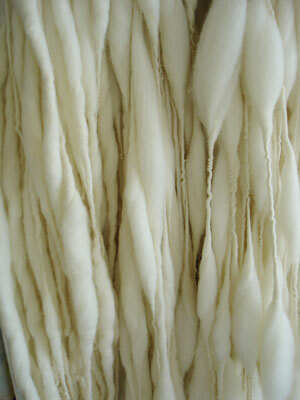 If the "slubs" will be 1,5 cm thick, then you need to rip your top lengthwise until each strand of wool is 1,5cm. Start to spin a medium yarn. 2 After 20 cm, draft promptly with your forward hand (here the left one) a large amount of fibers top form your first slub. 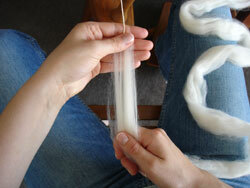 This mouvement is the most important: you need to control the amount of fiber you "bring" to the slub. 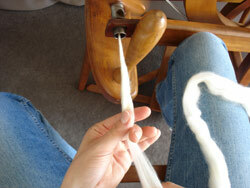 movement 2 : break the fibers at the end of the slub to go back to your medium spinning. 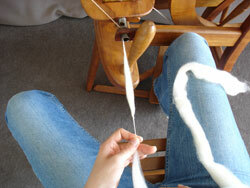 When the slub is before the orifice, slow down the feeding a little to ad torsion to this big thick piece of yarn. 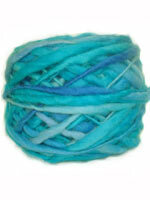 A slub with not enough torsion could break especially if you ply your slubby yarn. When you have done so, you may feed the orifice and make your slub enter the orifice. You keep on spinning 15/20 cm of medium yarn. 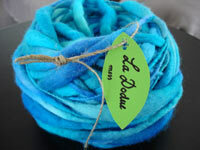 You can also be creative and spin an extra fin lace yarn with a huge slub every now and then (farther apart) and you will end up with an amazing texture (knitted, crocheted or woven, even felted): a nice and even fabric planted with big wooly parts looking like pompons. 8 You can vary the size of the slubs and the distance between them. - 1 ) to compensate the unbalance between the low twist thick and high twist thin parts. 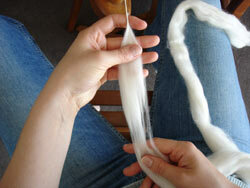 - 2) to felt a little the slubs to give them "corps" and to avoid the fabric to felt once it will be knitted or woven. 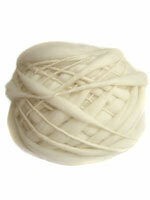 Thank to this tuto, you will be able to create wonderful creative yarns.